Nigerian-American lawyer/adviser Bobby Boye, convicted of defrauding Timor-Leste of more than US $3.51 million, has begun serving his six-year prison sentence. With time off for good behavior, he will get out on 18 February, 2021. Last April, Boye pleaded guilty as part of a plea-bargaining process, avoiding a trial which would have exposed information about his crimes to public scrutiny. He also promised to repay Timor-Leste for the damage caused by directing Timor-Leste Government contracts to his nonexistent company, which the court said was $3.51 million. La'o Hamutuk estimates that Boye's scams cost Timor-Leste about fifty times that amount, although the court and the prosecutors did not respond to our suggestion. 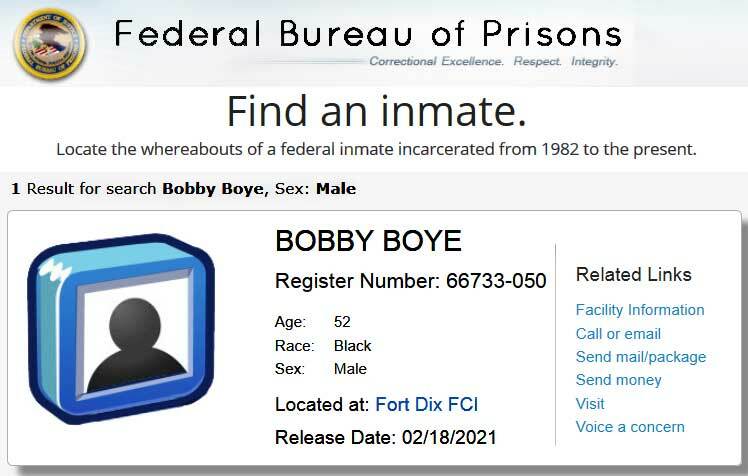 Although he admitted his guilt and promised to repay, Boye was apparently surprised that he received the maximum prison time under federal sentencing guidelines. After the sentence was handed down and explained by Judge Freda Wolfson on 15 October 2015, he fired his taxpayer-paid public defender and hired a private lawyer. On 16 November, Boye's new attorney Michael Confusione told the court that he intends to appeal the sentence, arguing that it should be little to no jail time because Timor-Leste received services in return for the fraudulent payments Boye extracted. On 25 November, Confusione and prosecutors filed motions back and forth about expediting the appeal process, which was denied. On 21 January 2016, another set of motions debated whether the appeal should be summarily dismissed. Confusione argued that the long sentence is a "miscarriage of justice," which prosecutors argued was "wholly unsupported by any argument, any case law, or any facts." Boye's attorney filed a 49-page appeal brief and supporting documents on 25 January. On 28 January, a three-judge appeals court panel rejected his appeal and upheld the lower court verdict and six-year sentence. La'o Hamutuk has collected the key documents in the appeal process here. La'o Hamutuk continues to hope that the competent Timor-Leste authorities will investigate who else was involved with Boye's crimes, especially Timorese officials, and take appropriate action to prosecute them. We have compiled a lot of information about these crimes and the U.S. legal process at http://www.laohamutuk.org/econ/corruption/Boye/14BoyeCase.htm, which we will continue to update.